What is a ticketing system? A ticketing system (support ticket system) is software that collects all customer support requests from a wide range of sources and manages them in one location. 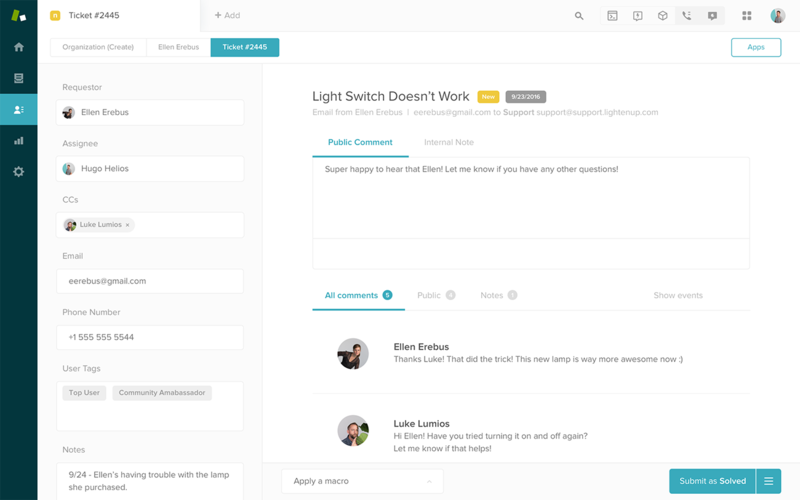 Zendesk is a ticketing system which acts as a shared inbox for all your customers’ questions and concerns. That way, no matter what channel the customer uses to contact the company—email, chat, Twitter etc-—the support agent is always provided with a consistent ticket, making ticket management much easier for the agent to more quickly solve the issue to customers' satisfaction. The growing number of channels customers now have at their disposal, while often convenient for the customer, can make it difficult to provide customers with consistent service. For years, many companies only allowed their customers to create support requests via web forms, which often forced customers to fill in required fields, such as their account number or service plan. This helped ensure the responding support agent had all the necessary context to provide support but was not always a great experience for the customer. Some prefer the immediacy of a phone call or brevity of a Tweet. Now agents are forced to respond to support requests that come in a variety of formats, many of which lack the requisite contextual data. What's more, the different formats can’t “speak” to each other, so if a customer emails a complaint to a company, then publicly Tweets the complaint, it’s entirely possible that two separate agents will respond to the customer without either one realising it. Also, that data is never captured for further use, making it impossible for support agents to refer to previous service issues with that customer. A ticketing system allows customers to contact a company via their preferred channel. It also ensures support agents are set up for success with a consistent view into the customers—including contextual data and previous support requests—within a highly organised system that tracks all relevant data over time, allowing teams to learn and improve the support they provide. A support ticket system allows support teams to streamline customer communications in a single ticket, all within an organised workflow. This leads to quicker resolution of individual support requests. And if the same customer asks for help again, the support agent will automatically have access to important information about the customer, including when they last requested support, what the issue was, how it was resolved, and even how long the customer had to wait for resolution. A support ticket system also enables the collection of data which can be used to improve a company’s support team as a whole. The reason for this is that a support ticket system allows for an issue tracking system, which gives visibility to into the big picture of a support team. So, if a specific issue is constantly being raised by multiple customers, the support team can be made aware of the issue and take actions like bug-tracking the problem for engineers, or providing an efficient self-service solution with help desk software. Customer support requests created via channels the company is not tracking will go unnoticed. Customer data will go untracked, making it difficult to provide efficient or customised support. In fact, every time a customer contacts a company, from the company’s point of view, it will seem like their first interaction with the customer. That does not make for a great customer experience. Bug-tracking will be mostly impossible. Zendesk is a ticketing system which acts as a shared inbox for all your customers’ questions and concerns. All support requests, including chats, phone calls, Tweets or emails, are stored in the online ticket system as tickets. Support agents can create workflows that ensure tickets are routed, assigned, and escalated, so nothing ever gets lost in cracks and all customer interactions become learning experiences. All customer data kept in the ticketing system is searchable, including tickets, knowledge base articles, forum posts and more. Agents are provided with a full audit trail so they can track every conversation from origin to resolution, even if it spanned multiple channels and agents. And as an issue-tracking system, it’s possible for your support team to learn and grow over time, leading to better self-service options (built with help desk software), more personalised support, and consistent, efficient customer support.